Nuri Bilge Ceylan’s latest feature is a deep psychological portrait set against an expansive landscape. Directed by Nuri Bilge Ceylan. In Turkish with subtitles. 189 min. Fri 2/22-Thu 2/28. Gene Siskel Film Center, 164 N. State, 312-846-2800, siskelfilmcenter.org, $11. The evolution of Nuri Bilge Ceylan's filmography has been one of the more encouraging cinematic developments of this decade. The most internationally successful Turkish filmmaker since Yilmaz Güney, Ceylan was a still photographer before he became a writer-director; his early features (among them Clouds of May and Distant) speak to the influence of his first medium, trading in landscapes, fixed perspectives, and extended wordless sequences. Though consistently lovely to look at, his films soon grew stale on a thematic level. By the time he made his fourth and fifth features, Climates (2006) and Three Monkeys (2008), it seemed as though Ceylan had exhausted whatever he had had to say and was filling out his scripts with art-movie cliches. He achieved a creative rebirth, though, with Once Upon a Time in Anatolia (2011), a film that developed rich ideas about guilt, repentance, and humanity's place in the universe. For the first time, Ceylan crafted a story worthy of his ambitious imagery. In its complex characters and philosophical conversations, Anatolia suggested that Ceylan was starting to look for inspiration in epic literature as well as still photography. His subsequent films, the Palme d'Or winner Winter Sleep (2014) and now The Wild Pear Tree (2018), have continued on this trajectory, burrowing deeper into the characters' souls while expanding Ceylan's sense of communal portraiture. Not coincidentally, both films feature writers as their protagonists, though the characters' literary ambitions pointedly do not reflect the filmmaker's own. The heroes of Winter Sleep and Wild Pear Tree are terminally inward looking, so obsessed with their own intellects that they're unable to comment meaningfully on the world around them. Ceylan still regards his protagonists with sympathetic fascination, studying them over extended running times so that their better qualities emerge alongside their faults. This tension between critique and understanding yields immersive psychological portraits, which Ceylan renders particularly stunning through frequent cutaways to characteristically expansive views of the environments the characters inhabit. Wild Pear Tree can also be described as expansive in that it considers the hero in the context of his entire family. 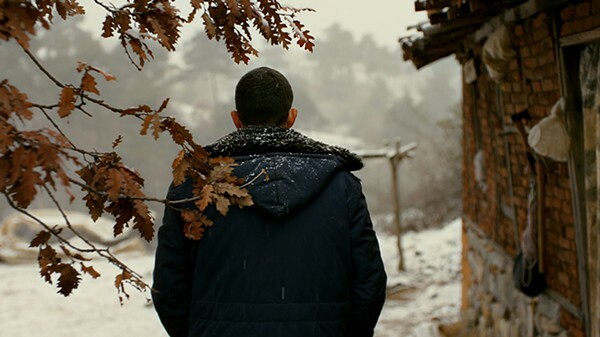 Sinan (Dogu Demirkol) is a recent college graduate who returns at the beginning of the film to his hometown in the northwest Turkish province of Çanakkale. He's written a book of essays that he describes as a personal memoir in the form of a regional study; while back home, he hopes to find a publisher or raise the funds to print the book himself. Ceylan (who wrote the script with his wife, Ebru Ceylan, and Akin Aksu) doesn't reveal Sinan's ambitions until maybe a half hour into Wild Pear Tree. Before this he introduces the character primarily in terms of his relationship with his father. Sinan's dad, Idris (Murat Cemcir), is a once-respected schoolteacher who's squandered most of the family's money betting on horse races. The first interaction in the film finds a store owner cornering Sinan and asking him when his father will repay a four-month-old loan. Based on this encounter, which ends with Sinan speaking dismissively of his father, one might expect Idris to be desperate and impulsive; however, the first surprise of Wild Pear Tree is that, when Sinan enters the family domicile, his father is revealed to be a genial, good-humored man who treats everyone around him with affection. Idris, who's about to retire, spends his weekends fixing up a family farm on the outskirts of town, devoting most of his time there to digging a well that seems unlikely to yield water. Sinan shares his father's persistence (he stubbornly makes his points again and again in most conversations he has), but not the old man's warmth. It soon becomes clear that Sinan isn't an especially nice person—he's pushy with social superiors and condescending toward anybody he regards as vulnerable. Much of the drama in Wild Pear Tree consists of conversations that Sinan has with others: each encounter reveals some new facet of the hero's arrogance. These conversations seem benign at first, as when Sinan talks big to a woman with whom he'd had a flirtatious relationship in high school, speaks contemptuously of Idris to his mother, or tries to amplify the merits of his book to the town's mayor, with whom he meets in the hope of securing an arts grant. Eventually Sinan's ego comes to seem hopelessly inflated. The film's first significant climax finds him pestering a local author at a bookstore—first for advice, then for the author's opinion of his literary worth—until the author blows up and pushes him away. The progression of the conversations goes a long way in making Wild Pear Tree feel like an epic; the accumulation of ideas feels downright monumental. Indeed the film is structured like a spiritual journey, with each of Sinan's encounters providing an opportunity to glean wisdom from others. (For the most part, however, he rejects these opportunities.) Ceylan often elides how much time passes between conversations—it could be hours, days, or weeks—and this slippery sense of time forces viewers to focus on the hero's internal development. The director also emphasizes this aspect through subtle visual cues; he likes to film the back of Sinan's head when the main character is walking (and he walks often over the course of the film), encouraging the viewer to imagine what's going on inside of it. He regularly depicts the hero's peregrinations through a mix of close-ups and extreme wide shots, so that one comes to regard him, alternately, as a complicated psychological case study and as a part of the landscape, a product of social and cosmic forces. He may bewilder, but he is never, ever predictable.